Further opportunities in the window fashion market have been created with the growth of digital printing and this is driving the demand for customisation. Consumers are much more design aware and confident about styling their homes. They want to express their personal style, and customisation of window fashion is an affordable and less risky soft furnishing option. At mid market and entry level the market is very much price and fashion driven. The return of the Chintz with a more modern take is very much on trend. Also we can expect to see more technical fabrics, natural materials and woven textures appearing. The increased call for Scandinavian design, predicted by our own Trend Scouts (see page 12) for bright accents, timber blinds and natural textiles are super-hot right now and can transform almost any space into one thatâ&#x20AC;&#x2122;s lively, bright and beautiful. Tropical is another trend appearing so I expect plantation style shutters and natural wood and bamboo will be a popular choice adding a modern feel to dining rooms as well as home offices. Designers and home owners are also aware of the added value that can be created when choosing the right window treatment. Clearly there is the positive influence of allowing as much natural day light into a room can have, both enriching the look and space but also the feel of a room. Light and temperature control can also provide cost savings, up to 12% on heating bills. Finally having asked Rod for his future predictions on the window fashion business, he commented â&#x20AC;&#x153;Motorisation is coming and it will be big. 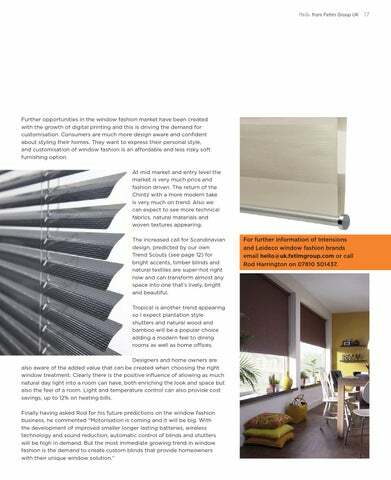 With the development of improved smaller longer lasting batteries, wireless technology and sound reduction, automatic control of blinds and shutters will be high in demand. But the most immediate growing trend in window fashion is the demand to create custom blinds that provide homeowners with their unique window solution.â&#x20AC;? For further information of Intensions and Leideco window fashion brands email hello@uk.fetimgroup.com or call Rod Harrington on 07810 501437.